The 1600 block of Chestnut Street is filled with eye-catching buildings. One particular property, 1606 Chestnut, stands out from the crowd with a distinctive English pale red sandstone façade. For 127 years, the building has evaded severe exterior alterations and the visual clumsiness of storefront modifications that disrupt the architectural symphony of Center City. From playing host to fine furniture makers to groundbreaking footwear innovators to one of the fanciest video arcades in Philly, this property has carried on with class. 1606 Chestnut when it was occupied by the Thackara Manufacturing Company. | Image: From Philadelphia, Pa: The Book of Its Bourse and Co-operating Public Bodies, Lippincott Press, 1899. 1606 Chestnut was built on speculation in 1890 by Isaac S. Miller. It was designed by one of the city’s most underrated and underappreciated architects, Albert W. Dilks, who worked on this building and one of his other surviving designs, 218 North 13th Street, at the same time. The four story building was fitted with two elevators and a skylight that allowed sunlight to reach the from the roof to the ground floor. A large, arched display window was placed at street level. The interior design and finishes were all designed and manufactured by woodworker Francis D. Kramer, who would be the building first tenant. The Francis D. Kramer Woodworking Company specialized in crafting first-rate furniture. Kramer’s company had grown exponentially in the decade since its modest beginnings in Old City. Business was booming and more room to deliver on a glowing reputation was needed. With the move, Kramer added wood decorations, mantels, metalwork, draperies, and upholstery production to his catalogue of offerings, along with the largest stained glass studio in the city. Kramer himself was an interior designer and both contract himself out for designs and had his company install all of the finishes, including painting and frescoing walls and ceilings. 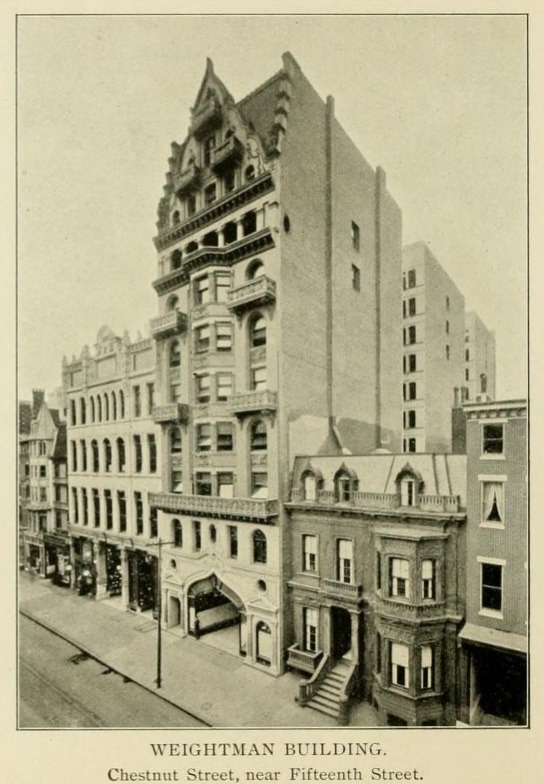 The company flourished on Chestnut Street until Kramer’s untimely death in 1898. After Kramer’s company moved out, Thackara Manufacturing Company converted the building into a heavier industrial use for the production of furnaces, ranges, and stoves. The company was downsizing after the death of their namesake, having moved from a much larger building, designed by Willis G Hale, a block away. From 1907 to the early 1920s, rug dealers Zermann & Blackburne occupied the property. In the 1920s, the Claflin Shoe Store took over the building. The store was the flagship retail arm of the Waldo M. Claflin Company, who designed, manufactured, and sold shoes in Philadelphia since 1868. Claflin himself designed the first shoes made for playing baseball and many of his shoes are part of the collection of the Philadelphia Museum of Art. Claflin’s Shoes would occupy 1606 Chestnut for several decades and inspired other shoe stores to open on the same block. The building’s shoe-related uses would continue through the mid-20th century, and even housed the offices of the Philadelphia Retail Shoe Association in the 1960s. After several years as a dress shop, the ground floor retail space became Supercade Amusement Center in 1980, which distinguished itself from other Chestnut Street arcades and teen-targeted attractions of the era with a stained glass sign over the door. In 1985, business declined after the City forced arcades to close earlier in response to a series of weekend disturbances by large crowds of teenagers, culminating with a 5,000-strong “wilding,” on Easter Sunday of that year. Poor sales may be why the owner opened a check cashing business in the arcade on the 2nd floor. By 1989, the arcade craze was over and 2 Liberty Place was under construction across the street. The check cashing business moved downstairs and stayed in business until September 2001. In 2002, work began on converting the building for mixed-use, gifting this fine structure another century of use. The upper floors had been sealed for decades and the building’s exterior was in forlorn shape. The ground floor fenestration was returned to something more akin to the building’s original configuration. When renovations were completed in 2004, the residential units were listed for sale as condominiums and Liberty Travel moved into the retail space. Indochino, a men’s custom apparel store, opened in 2015. It’s a shame that the stained glass over the door was not restored. What happened to it? Have you any information about Mann & Dilks, a clothing establishment at 1630 Chestnut St. in 1920? I have a wedding dress from there.